New Delhi: The Jahangirpuri – Samaypur Badli Metro corridor of the Delhi Metro was formally flagged off for passenger services today by the Union Minister of Urban Development, Sh. M. Venkaiah Naidu and the Chief Minister of Delhi, Sh. Arvind Kejriwal. The 4.373 km long elevated corridor will be an extension of the already operational Yellow Line from HUDA City Centre to Jahangirpuri. Close to 29,000 additional commuters are expected to use this new section comprising of three new stations. Speaking on the occasion, Sh. 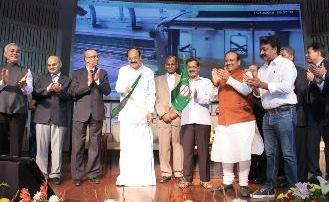 Naidu complimented DMRC for finishing the project on time and said that other organisations should also follow Delhi Metro’s example. He also appreciated DMRC for taking various environment friendly measures such as the installation of roof top solar power panels at the stations as well as the provision for rain water harvesting. The Chief Minister of Delhi, Sh. Arvind Kejriwal said that DMRC has shown that government agencies can also work efficiently and complete their projects within schedule. He congratulated the Delhi Metro officials for presenting the people with a clean and efficient transport system. Going back to cars should not be allowed. I will be suggesting to DMRC and also hold a review meeting with them. They will be going for additional coaches and increasing the frequency as well so that more coaches and more trips are there and people can be accommodated,” Naidu said. Earlier, Kejriwal flagged the issue of overcrowding of metro coaches saying it was compelling a section to opt for other means of transport including private vehicles which, he said, was “not a good thing”. “Crowd is going up every year resulting in a major section preferring other means over metro. But the real success of metro is achieved when a person takes metro over car. Middle class and even upper middle class had started using the metro. “But due to the crowd, metro is no longer comfortable. It is turning into locals of Mumbai where you are pushed in and out of coaches by the crowd,” Kejriwal said. Delhi Metro’s Managing Director, Dr. Mangu Singh informed that with the opening of this section, Delhi Metro had commissioned 22 kms out of the 159 kilometres being constructed as part of Phase 3. The occasion was also attended by Member of Parliament, Dr. Udit Raj, MLAs Sh. Vijender Gupta and Sh. Ajesh Yadav, Additional Secretary, Ministry of Urban Development, Sh. D.S Mishra and Delhi’s Chief Secretary, Sh. K.K Sharma. With the opening of this section, Delhi Metro’s total network length has increased to 213 kilometres with 160 stations. The Yellow Line (Line 2) of the Delhi Metro now extends from HUDA City Centre till Samaypur Badli with a length of 49 kilometres.